Promenade is inspired by a traditional arch and keystone architectural detail, but expressed in an updated style for today's home. A cylindrical glass shade is set neatly within an open frame to provide a traditional candle look. The diffuser encircles an energy-efficient, compact fluorescent bulb that is included with the fixture. This outdoor pendant pairs well with classic outdoor dicor themes and rustic styled homes. The beautiful silhouette and rubbed oil bronze finish captures attention and sets the garden mood alight. This lantern is open at the bottom for easy light bulb access. Closed top with full glass base provides light over outdoor table and porch area. Outdoor pendant includes hardware, installation instructions, 5 inch diameter ceiling plate, and 3 foot chain for hanging adjustments. Made of weather resistant cast aluminum. Hardwire installation required. instructions and hardware included. Elegant French onion style lantern with ornate finial s and clear beveled glass. Made of weather resistant cast aluminum. Outdoor pendant includes hardware, installation instructions, 5 inch diameter ceiling plate, and 3 foot chain for hanging adjustments. The Piper Lantern offers style and practicality at affordable prices. It's eye catching design makes for a beautiful addition that will enhance the exterior of your home. This fixture is beautifully finished in Old Bronze and complimented by Clear Seed Glass. This fixture uses (1) 60 watt A19 maximum/medium base bulb. Promenade Collection 1-Light Black Hanging Lantern Promenade is inspired by a traditional arch and keystone architectural detail, but expressed in an updated style for today's home. A cylindrical glass shade is set neatly within an open frame to provide a traditional candle look. The diffuser encircles an energy-efficient, compact fluorescent bulb that is included with the fixture. 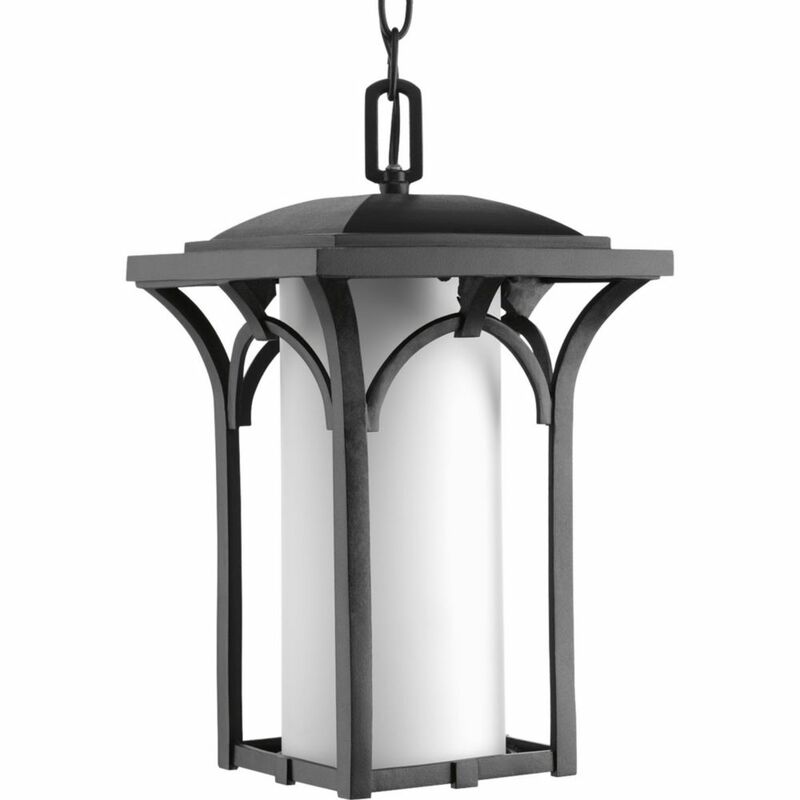 Promenade Collection 1-Light Black Hanging Lantern is rated 4.0 out of 5 by 2. Rated 5 out of 5 by Mitzi from Well made, timely delivery. Very happy.... Well made, timely delivery. Very happy. Rated 3 out of 5 by BigDuke10 from Promenade Collection 1-Light Black Outdoor Hanging Lantern This lamp arrived quickly and looks real nice BUT it is not dusk to dawn as advertised, has no solar cell. I'm returning it to the store and hoping I can find one that is dusk to dawn.